Just returned after four days in Sequoia National Park. 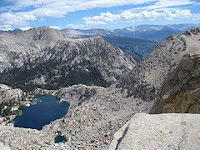 We hiked out of Mineral King over Franklin Pass, to Forester Lake. Then we turned around and came back. It’s beautiful out there and being around all those peaks and clear cold lakes rubs off on my physical sense of well being. The fact that I’m looking way up at those snowy crags, then a few hours later climbing over them, contributes to the feeling of hale puissance. Franklin Pass is like that. You climb 3000 vertical feet from the trail head to Franklin Lake, then another 1500 feet up what looks like an impassible granite face. It’s a narrow trail carved into the slope – a few inches of level ground in a vertical world. When we got to the top we lost the trail under snow and as I was looking for the route over the top, I found myself staring down into thin air – and granite hundreds of feet below. So is it just the proximity to death that makes me feel so alive? (A note to the mother in law potentially reading this: we were never in any danger, any time you are up high and look down you get that thrill). Perhaps that’s part of it, but I contend that there’s more than that. Here we are up where it’s hard to get enough oxygen, sleeping in what amounts to stress positions all night, getting sunburned and carrying packs over ankle-twisting trails and the net result is feeling healthier and stronger? It doesn’t make sense. I think it has something to do with pushing the body. We spend so much time coddling ourselves with orthopedic comfort chairs, and medical treatments for every little ailment – and in the long run we end up getting worse. Perhaps a better solution would be to go out and get bruised, scratched and sunburnt. Photo by pab_lo49 – yes neither of us brought a camera.